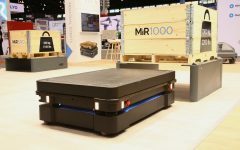 The cloud platform from C2RO robotics, which was an exhibitor at RoboBusiness 2017, was recently part of a demonstration by the MIT Senseable City Lab. The project showed how thermal sensors can be linked to processing in the cloud for public safety and other functions. The Senseable City Lab (SCL) at the Massachusetts Institute of Technology has implemented an experimental sensor data stream using C2RO Robotics’ cloud platform. This experiment was part of a recent SCL project aiming to equip a single-purpose streetlight with various sensors to create a multi-functional digital platform and provide services such as pedestrian detection in modern cities. Thermal cameras were used for this data-streaming experience. They have enormous potential for data insights because of their ability to detect pedestrians even in various light and weather conditions, without compromising individual privacy. In the past, turning thermal data into information on pedestrian traffic has been a challenge because of the processor-intensive task of sensory analysis. But now, C2RO’s platform eliminates the need for expensive on-camera processing power by moving the heavy lifting to the cloud, thereby significantly reducing implementation costs and expanding commercial uses of the technology. Montreal-based C2RO’s cloud platform analyzes image feedback from the distributed thermal cameras to autonomously detect the presence of people. The C2RO dashboard displays image feedback in real time, showing a constant count of humans in the frame and activity over time. Collecting pedestrian traffic data at scale could have major implications for crowd-control efforts, autonomous vehicles, and disaster relief, where the value of human detection would be measured in lives saved. The cloud platform technology will be especially useful for urban planning professionals and emergency monitoring systems, which can more easily glean information about metro areas. C2RO grants a scalable Software-as-a-Service (SaaS) solution, with almost no computation required in the device (sensor) side. Backed by a proprietary technology and six years’ worth of research, the real-time data processing technology allows for sensors spread even across the country to connect together, enhancing the accumulated insight of data collected. These analytics are augmented by machine learning modules running on the cloud, allowing for a wide range of smart cities and device/robot collaboration use cases. A spokesman said that C2RO is the only company managing this type of real-time data processing, thanks to patent-pending technology developed with Indiana University. C2RO’s beta product is expected to be released to a wider audience of users in the upcoming weeks. Visit C2RO’s website for more product information. With increasing demand for a more data-driven understanding of our future world, such urban projects are a major breakthrough in learning more about diverse and populous metropolitan areas. C2RO Robotics offers a SaaS platform that uses real-time data processing technologies to enable artificial intelligence software solutions for any sensor, device, or robot in a fast, secure, scalable and inexpensive manner. It augments the perception and collaboration capabilities of devices even those low-cost with limited sensing and computation resources. You can visit C2RO online at c2ro.com, and sign up for C2RO’s product beta release, or find its recent paper, “Real-Time Cloud Robotics in Practical Smart City Applications,” at IEEE PIMRC 2017.